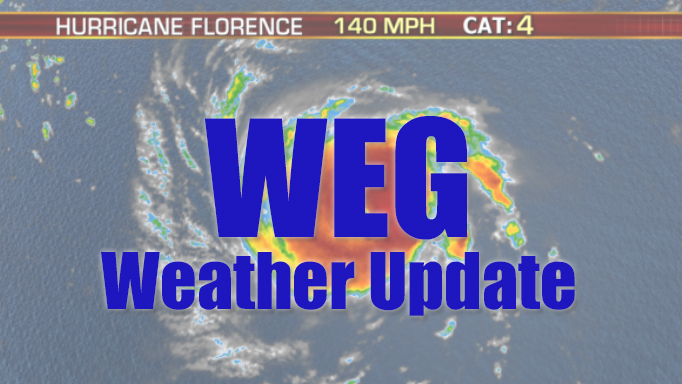 The Opening Ceremonies for the 8th edition of the World Equestrian Games (WEG) are set to take place in Tryon, North Carolina tonight as the state prepares for Florence, a dangerous category 4 hurricane. The storm is predicted to make landfall Friday on the coast of North Carolina where a mandatory evacuation of 1 million residents has been ordered. State officials have advised residents to prepare to lose power for several days or weeks and gas shortages have already been reported. The cross-country phase of Eventing is scheduled for Saturday but if conditions necessitate the course could be shortened or the date of the competition moved. The WEG vendors area was flooded on Monday morning. 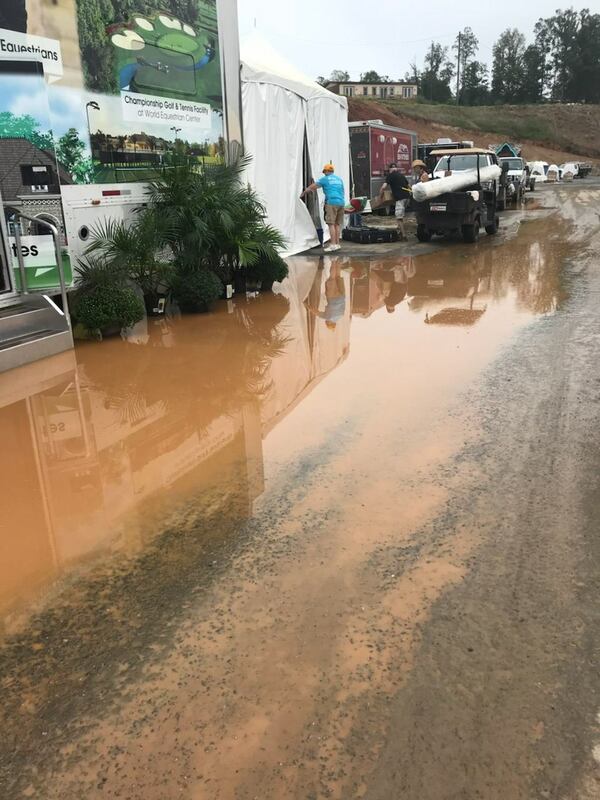 Though the worst is yet to come, the venue has already had some minor rainfall amounting to .18” over the last few days which had already caused the vendors area and one parking lot to flood. The WEG organizing committee have noted that there is an onsite weather station at the Tryon International Equestrian Centre and the National Weather Service is providing them with weather updates every six hours. The facility has 1,188 permanent stalls onsite and all barns are built in conformance with the International Building Code to withstand winds up to 90mph (144kph), so the horses are in the safest on-site. TIEC became a refuge for horses from five states ahead of Hurricane Irma in August/September last year. Organizers are working with the USDA to ensure that, in the event of extreme weather, all horses in the post-arrival quarantine facilities will be stabled in Barn 5, not in the tent extension. Three different electrical suppliers are on hand and have numerous generators on-site. There are also two high-volume wells on the property, both of which are attached to the emergency generators and which supply drinkable water. • Continuing discussions with airports and Emirates airline (through Peden Bloodstock/Dutta Corporation) on any necessary steps regarding horse arrivals/departures. Any decision on delays to competitions or potential cancellation, would be made in accordance with FEI General Regulations, Article 109.12: Subject to the unanimous agreement of the President of the Ground Jury, Technical Delegate and President of the Veterinary Committee in consultation with the Organiser, a Competition (either before or during) can be postponed and/or cancelled, not only due to force majeure, catastrophic occurrences, extreme weather conditions but also for non-compliance with FEI Rules and in specific situations where the welfare or safety of the Horses, Athletes, Officials or the public is compromised. If sport has to be delayed all tickets will be honoured. For immediate National Weather Service updates, text “WEG2018” to 888777 (US phones only) or check out the Tryon2018.com website and on Facebook and Twitter at @Tryon2018. Any potential updates to schedules and programming will also be posted to the Tryon WEG channels. A category 4 hurricane is the second highest classification with maximum sustained winds of 130-156 mph. AccuWeather reports that a category 5 hurricane has never struck the Carolinas and only three category 4 hurricanes have make a direct landfall: Hazel 1954, Gracie 1959, and Hugo 1989. Last year’s hurricane Matthew was a category 5 that battered Haiti and the Bahamas and though it stayed off of the US shore it caused torrential rains with as much as 15.65″ recorded in on North Carolina location and was responsible for 28 deaths in the state.